I have made many simple bentos but I think this is the most simple one of all. My hubby loves pumpernickel bread and he purchased this swirl rye and pumpernickel bread which I kind of like since I love rye bread myself. Main section: Pumpernickel and rye swirl bread with an elephant pick and a couple of seedless red grapes. Upper right: Elephant shaped cantaloupe which I used a small cutter and stamp to make. Far right edge: Pretzels. Packed in Laptop Lunches. 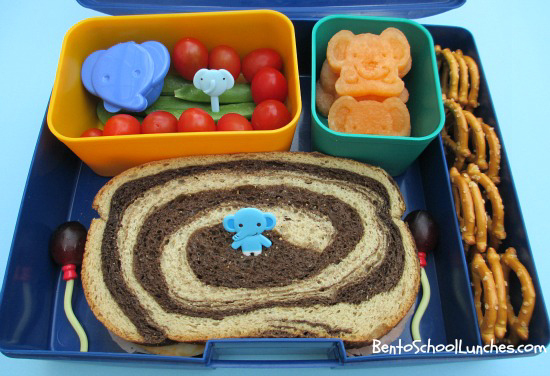 Such a colorful and cute bento! I love your elephant cantaloupe. That Looks yummy! Did you made the Bread Yourself? Love the swirls in the bread, bet it tastes yummy too! Great lunch! Looks lovely! The bread is beautiful, and the elephants stamped into the cantaloup is genius!! I have those stamps but never would have thought to use them that way! 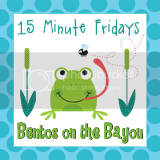 Thank you for linking to 15 Minute Fridays!